WASHINGTON--(BUSINESS WIRE)--Hitachi, Ltd. (TSE: 6501) today announced that it has developed an all-in one, container-type energy storage system as a core energy product for ensuring the stable use of distributed renewable energy such as wind and solar power, while maintaining the power supply-demand balance. This energy storage system fuses Hitachi’s electricity grid control technologies built up in the Hitachi Group and Hitachi Chemical Co., Ltd.’s battery-related expertise and will be offered as a packaged system. In the beginning of 2014, Hitachi plans to begin a demonstration test of this energy storage system in North America. Plans call for Hitachi to reflect the results of this testing in a commercial product after verifying the commercial viability and performance of the system in the electricity trading market, or the so-called ancillary market*2 connected with maintaining the electricity supply-demand balance. 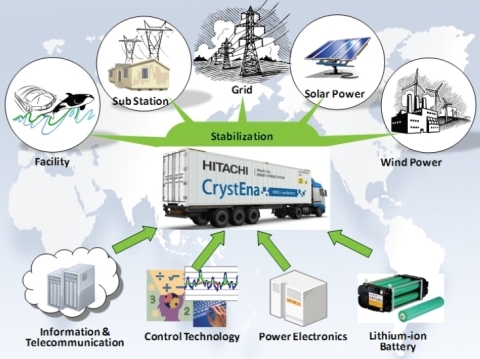 Furthermore, Hitachi will examine whether to promote the system, to be named “CrystEna” (Crystal+Energy), as one of its solution businesses for expanding the transmission & distribution business in the global market. At present, wind, solar and other forms of distributed renewable energy are attracting attention around the world as a way to reduce CO2 emissions. Demand for energy storage systems is anticipated to grow rapidly because such systems can help maintain the electricity supply-demand balance, effectively utilize energy, and stabilize power quality. The European and North American markets, which are leading the way in electricity deregulation, in particular are expected to see a further increase in the use of distributed renewable energy, spurred by the materialization of plans to construct transmission networks that will transmit power generated from renewable energies to major cities, and by the introduction of subsidies such as tax credit and feed-in tariff (FIT) schemes. The necessity for energy storage systems is thus rising for maintaining the supply-demand balance, power frequencies and voltages, securing backup power, and eliminating the impact on grid operations. The Hitachi Group has been involved in the energy storage business over several decades. It has leveraged Hitachi Group technologies and expertise in a wide range of fields including: electricity generation, transmission and distribution to grid stabilization to develop everything from facilities to manufacture batteries to systems for providing materials, batteries, power conditioning systems (PCS), control systems and other systems under one roof. The 1 MW lithium-ion battery energy storage system package announced today utilizes Hitachi Chemical’s lithium-ion batteries to raise system performance, such as extended expected battery lifetime, and realize high economic viability. It was developed with an emphasis on maximizing the benefits to be obtained by customers during long-term use. Initially, Hitachi will conduct field trials in the rapidly growing U.S. ancillary market and plans to accumulate know-how from testing battery capacity optimality and durability as well as the control algorithms written to maximize income from power sales. 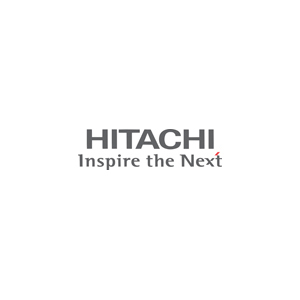 Having positioned transmission & distribution systems as a core business of the Power Systems Business, Hitachi is endeavoring to expand solutions businesses fusing equipment, control systems, other IT and power electronics technologies. Hitachi aims to provide power transmission and distribution solutions for various needs in countries and regions looking to strengthen and enhance their power transmission networks.